November 11th, 2014, Charlottetown – P.E.I. speed skaters swept top division gold over the weekend at the Atlantic Cup Speed Skating Championships at the Eastlink Centre in Charlottetown. Michael Rogers and Carly Connell led the way for the Island team, taking top honours among male and female skaters respectively. Their gold medal wins were part of a 26-medal home-ice haul for P.E.I, which included nine gold. 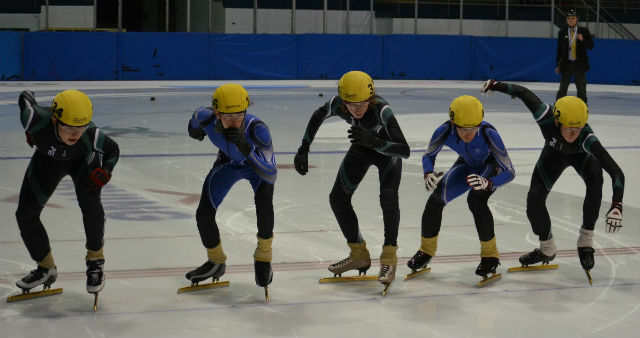 Islanders Jared Vriends (left), Peter McQuaid (centre) and Michael Rogers (right) get into starting position at the recent Atlantic Cup Speed Skating Championships in Charlottetown. Rogers and Vriends won two of P.E.I.’s 26 medals at the event. Also pictured are Isaac Gallagher (2nd left) and Frederic Cammarano (2nd right), both of Fredericton. Photo courtesy of Duncan McSporran. Connell skated to gold on the strength of three new provincial record times for Intermediate women. The Charlottetown skater smashed Ellen Christie’s 2007 records in the 500m and 1000m distances by almost 2 seconds each. Connell also bettered a 12 year-old record previously held by Jenna Gallant in the 1500m distance. Rogers earned his overall title with wins in three of four distances, including personal best times in three distances. Also earning a medal for P.E.I. in the top division was Jared Vriends with a bronze. Isaac Gallagher of Fredericton snagged the silver among top division males. Zach Moran of Charlottetown finished 4th overall, while siblings Andrew and Peter McQuaid rounded out the Island contingent in the top division, as both broke 50 seconds in the 500m distance for the first time. Also taking gold medals for the host P.E.I. team were Korrina LeClair (Division 2), Kyle Connell (Division 6), Matthew Kozma (Division 7), Daniel McKinnon of Murray River (Division 8), Madelyn Iwankow of Canoe Cove (Division 10), Rob Binns (Masters / Sport Class) and Jenn Nickerson (Masters). Kyle Connell set a new Provincial record for 12 year-old boys in the 200m distance, nipping Peter McQuaid’s 2012 standard by 2 tenths of a second. Binns established a new provincial record time for Masters (40+) skaters in the 777m distance. Miriam Burnett of Charlottetown (left) works on an outside pass against a trio of New Brunswick skaters at the recent Atlantic Cup meet in Charlottetown. Burnett set a new provincial record and earned a bronze medal for the host P.E.I. club. Photo courtesy of Duncan McSporran. Miriam Burnett added to her collection of Provincial records with a new mark for 14 year-old girls in the 1500m distance on her way to a bronze medal in a very fast Division 5. Earning silver medals for the Island squad were Brandon Richard (Masters / Sport Class), Thomas McQuaid (Division 6), Eliana Monthony (Division 6), Mia Stewart (Division 7), Daniel Chapman of the new Eastern Kings Speed Skating club (Division 8), Isabel Wagner (Division 8), Liam Chatfield (Division 9) and Renee Chapman of Eastern Kings (Division 9). Also taking home bronze for P.E.I. were Dave Iwankow (Masters), Andrew Binns (Division 5), Kristen Binns (Division 6), Karla Mccallum (Division 7), Addison Bruce (Division 8), Jenna Larter (Division 8) and Saul Grant (Division 10).